Where do mariachi, charros, and sombreros all hail from? Jalisco! That’s why our Salt & Wind founder, Aida Mollenkamp, is pairing up with Kristen Kellogg of Border Free Travels to take guests on an intimate group trip to one of their favorite parts of Mexico: Jalisco! Roam the city and learn about local artisan crafts, taste the best of the "born in Guadalajara" street food from birria to carne en su jugo, and ride horseback through a sea of blue agave while learning the secrets of Tequila. Join our group trip or have us create a custom Guadalajara itinerary for you! An on-point food scene, tons of Mexican tradition, gorgeous design and handcrafts — all of our favorite things come together in Guadalajara and Tequila. To us, Guadalajara and Tequila don’t get the food credit credit their due. 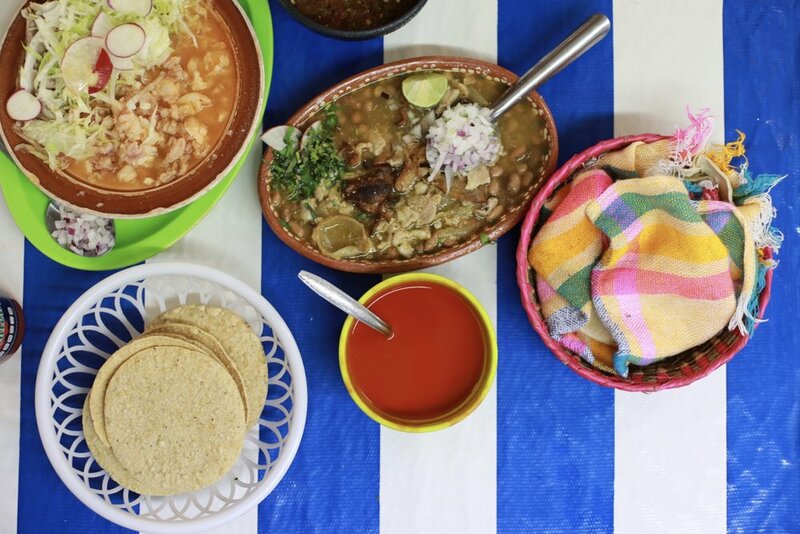 Some of the best traditional Mexican foods – we’re talking birria, tortas ahogadas, carne en su jugo, pozole, jericallas – call Jalisco home and there’s no better place to eat these classic dishes than in the streets of Guadalajara. Though it has a population on par with Los Angeles, the center of Guadalajara has a vibe that’s more on par with Boston. And like that city, Guadalajara is walkable, there’s tons to discover, and it’s fiercely unique. As home to many of Mexico’s best-known traditions – ahem, mariachis, charros, and sombreros – it has got some legit roots yet its thriving street art scene and many indie boutiques give it a decidedly modern feel. And tequila? Well, the king of Mexican spirits calls the state of Jalisco its home base with the majority of tequila in Mexico being produced here. There’s no better place to get to know all about this agave spirit than among the rolling fields of blue agave. Kristen lives part time in Mexico City and, as evidence by our Mexican wine country tours, Aida loves all things Mexico — from the food to the history. Following the success of their Mexico City group trips, they’re launching group trips to Guadalajara starting in March 2019. Each of group travel experiences is unique so we don't have a set Guadalajara itinerary. However, we work with the same partners to guarantee quality across all our trips. During our group trip to Jalisco, we’ll stay at a high-end design hotel in a hip neighborhood of Guadalajara. With a rooftop pool, great cocktails, gorgeous design, and on-point service, it’ll be hard to leave your room! Why did you guys choose to host group trips to Jalisco? 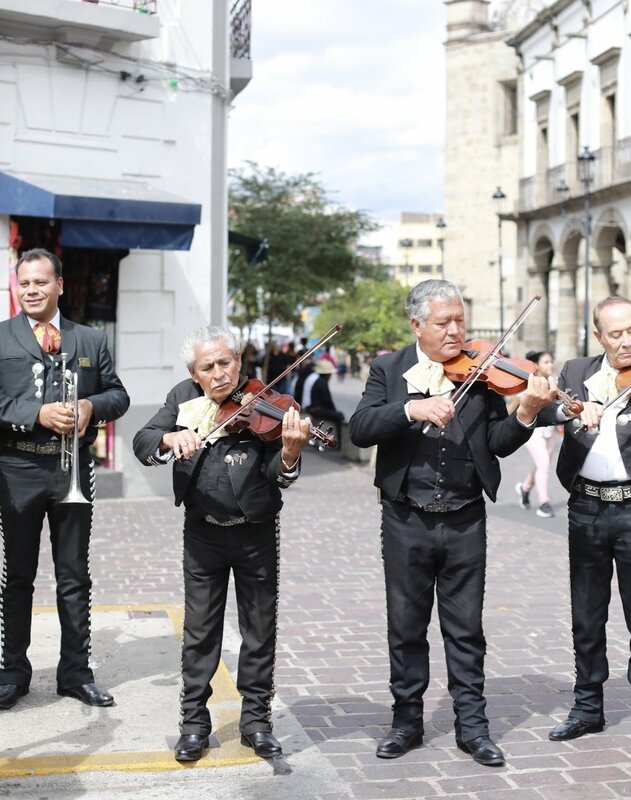 Jalisco is home to so much we love about Mexican culture: mariachis, charros, street food, and tequila! On this trip we’ll show you the creative side to Mexico’s second largest city — Guadalajara — and then head into the agave fields to learn all about the king of Mexican spirits: tequila. What sort of traveler would enjoy the Guadalajara and Tequila trip? Our Jalisco trip is for an food lover who wants to see a mix of modern and classic Meixco. It's a long weekend filled with everything from high end to authentic experiences, hands-on workshops to expert-led tours, and everything is carefully curated by your hosts, Aida of Salt & Wind Travel and Kristen of Border Free Travels. The entire itinerary takes place within about 50 mile radius so there’s not too much car time. And, we do our best to break it up so you never have to be in the car for more than 90 minutes at one time. Of course, unforeseen circumstances or traffic could cause delays but we’ll do our best! What is the weather like in Jalisco in the Spring? What should I pack? Spring is usually some of the best weather of the year in Jalisco with average temperatures ranging from the low 50s to mid 70s and about five days of rain. We'll meet at the hotel in Guadalajara; however, we can definitely help you get there so just ask! Oh, and once you book your trip, we’ll send you loads more information about the trip specifics including exactly where to meet, what time to meet, and, of course, a contact person you can call if you're running late. We do not directly book flights nor does the trip price cover airfare from your hometown to Guadalajara. But, we can help! Just ask and we'll connect you with our travel agent who can assist you with those details. Great! We plan to add on day trips or trip extensions to the trips in the near future. For now, you can use our concierge (for an additional fee) to arrange additional tours, restaurants, or hotel nights. And, if you want to stay longer in Guadalajara, we can help you get preferred rates with our hotel partners. Look, earthquakes are a real possibility in Mexico so it's best to be prepared. Just as we do in any other earthquake-prone city, we keep a pair of sneakers by the door and our phone, wallet, and keys close to our nightstand in case of emergency. We urge you to check the CDC website so that you have the most updated information about Zika in Mexico, especially if you plan to travel elsewhere in the country before or after our trip.